Many people who benefit from the current system would lose out, and are likely to resist these changes. Making these changes actually happen would depend on immense political will and the support of many constituencies in our society. The case for the government to be reconfigured and the number of departments to be cut seems overwhelming. There are currently 34 Cabinet Ministers, all with deputy ministers, and directors-general and department heads – and all with a fleet of expensive cars, security, and many other trappings of power. The structure of our state, with government work being done in Pretoria and Parliament sitting in Cape Town, means that there is immense duplication, and travelling costs go through the roof. In a country with so many pressing needs, and so many people in great need of government services, this is unsustainable. However, it should not be forgotten that in terms of actual numbers, the amount spent on Cabinet is a fraction of the total expenditure of government. Reducing the Cabinet by half would definitely save money, but it is unlikely that many citizens would feel the impact. It is only if the actual total payroll of government is cut back significantly that this change would be felt. But there is an important political symbolism to this; it is about the need for the government to show that it is not wasting money taken through tax from citizens. Intriguingly, in all of the discussions, there is no renewed mention of the idea of having just one capital city, and of moving Parliament to Gauteng. Former President Jacob Zuma used his State of the Nation Address in 2016 to say that this idea must be properly investigated. So far, very little seems to have come if it. However, none of this takes into account the fundamental reasons as to why the government has become bloated, and why the number of departments has risen. It is because it was in the interests of the leader of the time to have a bigger government. The more Cabinet positions there are, the easier it is to bring in more people on the patronage gravy train, and to buy off enemies. And it is also a good way to make sure that nothing can happen to you because it becomes harder for a bigger Cabinet to plot against you. In the end, you have a larger group of people who you have personally appointed, which can only be in your interests. This must also mean, then, that it could well be against the interests of the incumbent political leader to reduce the number of Cabinet positions. 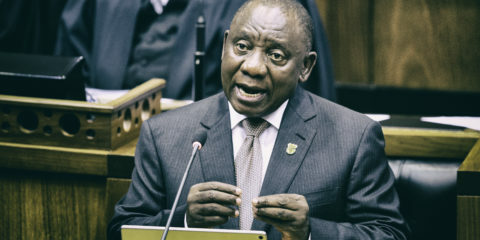 In other words, the improvement of governance, in this case, is actually against the political interests of Ramaphosa. The current ministers will not be keen to participate in the government version of the game of musical chairs, while the young and ambitious will see their chances diminished. This means that for the current ministers, it is in their interests to have a bigger Cabinet, and thus to support anyone who tries to keep its size as it is. Then there are the structural reasons for this particular problem. The ANC, being the broad church that it is, needs to ensure that its Cabinet actually reflects the country in many ways. This means that constituencies that represent different languages, different political ideologies, different parts of the alliance (Cosatu, the SACP, etc), different ages, all have to be accommodated. And it must be balanced along gender lines. And the Cabinet has to include both friends and enemies of the President. To add to the complication, there may also be a discussion about including someone from another party in the Cabinet, as has happened many times since 1994. Just managing all of that into 34 departments is hard enough; cutting it down to – say 20 – would indeed be a difficult task. We are likely to actually see whether this plan will be acted upon only after the election itself when Ramaphosa announces his Cabinet after the inauguration. The Cabinet is usually appointed after the ANC’s national executive committee has met to discuss it. That meeting is likely to be one of the most important, and consequential, the party’s leadership will have in the next five years. The tone of that meeting could well depend on the ANC’s actual showing in the elections. However, on a difficulty scale, the politics of reducing Cabinet is nothing compared to the politics of reducing the number of provinces. This has been a perennial discussion in the ANC. The party’s Nasrec conference did resolve to reduce the number from nine to six. In fact, the idea was also heavily discussed as far back as 2007, at the ANC’s Polokwane conference. Again, the case to reduce the number of provinces is fairly strong. More provinces leads to more premiers, MECs, departments, bodyguards and BMWs… And the local strongmen. No doubt, some of the arguments that will be put forward for this change will be what’s happened in North West and other places, where governance has all but failed, and some government services are still almost non-existent. However, having a bigger administration covering a larger geographical area is no guarantee that government services would improve. There may be fewer opportunities for graft (simply because there will be fewer officials and fewer decision-making chains) but there would still need to be strong state machinery to ensure proper services. But it could also be argued that this would be an opportunity to redesign part of the machinery of the state, using the lessons learnt over the last 25 years. Despite all of that, it is still unlikely to happen. First, in the ANC itself, it would be asking leaderships of provinces, entire ecosystems, to agree to vote themselves out of the power they currently live on. That’s unlikely. Then there is the problem of the mechanism to do this. The borders of the provinces are outlined in the Constitution; to change them requires a Constitutional amendment, which requires a two-thirds majority. Which would mean, as things stand, that the opposition parties, and probably the DA, would have to agree. The DA is unlikely to agree to anything that is not in its interests. Certainly, it would not vote to change the borders of the Western Cape, which it controls. The party also seems to believe it could one day control Gauteng, which means that a change to its borders would have to be done in a way that the DA believes would give it a stronger chance of power there. In other words, again, it is almost impossible to see how this change could be made. This article was originally posted on Daily Maverick First Thing.